How Can a Deviated Septum Cause Sleep Apnea? Deviated septum in one of the commonest types of nasal obstruction. The irregular shape of nasal septum may partially block the passage of air and interfere with breathing. Depending on severity, a person with deviated nasal septum can develop obstructive sleep apnea. To understand what is a nasal septum, and how to identify it, check the following short video. As you'll notice, if the shape of your nasal septum is not straight, but has an irregular shape, then you have a deviated nasal septum. 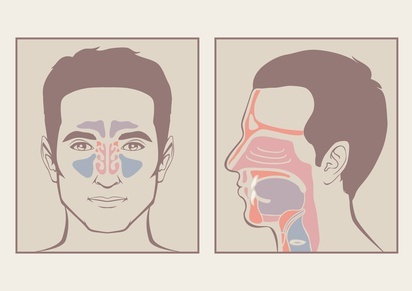 Nasal airflow is critical to good breathing, because anything that causes airway narrowing can lead to breathing problems. In the nose, for example, the nasal septum is often crooked from birth or as the result of blunt trauma during childhood or adulthood. A patient with nasal obstruction will often open his mouth during sleep, and this reflex contributes to sleep breathing disorders, including snoring and sleep apnea. first, the nose functions as a heating element. Did you ever notice that if you breathe through your mouth, you will get a very dry mouth and throat? The air passing through the nose is slightly warmed and reaches the lungs at a temperature more comfortable for the body. second, the nose functions as a filter for dust particles and other pollutants that are inhaled from the air. Furthermore, there are special sensors in the nose that relay information to the brain's repsiratory center on airflow passing over them. Using these sensors, the nose actively participates in controlling and managing respiration. Without these sensors, we couldn't understand properly how much air enters in our lungs. Can a Deviated Septum Cause Sleep Apnea? while opening the mouth in sleep, the chin and rest of the mandible move posteriorly and inferiorly to displace the tongue in that direction. This directly narrows the pharyngeal airway. second, opening the mouth decreases the length and tension of the muscles surrounding the airway, increasing the airway resistance. trying to breathe through the nose despite the blockage, increases the negative pressure in the thorax. If there is a narrowing somewhere in the upper airways (the main cause of sleep apnea), the pressure will lead, according to the Bernoulli principle, to a collapse at the point of narrowing, resulting in apneas during sleep. This assumption gained further credence when it became clear that a misshapen nasal septum - a common cause of narrowed nasal airways - is extremely prevalent in sleep apnea syndrome patients. Bottom line... Nasal obstruction doesn't directly cause sleep apnea, because the collapse of the airways does not occur in the nose. However, indirectly, there is a link between nasal septum deviation and sleep breathing disorders, including snoring and sleep apnea. So, clearing the obstruction of the nasal passages, will help you improve breathing during sleep and even prevent the collapse of the airway (sleep apnea). Now we started to understand how important is to have a healthy nose, without obstruction. In other words, fixing the deviated nasal septum or enlarged turbinates will help you improve breathing during sleep, and even sleep apnea and snoring. Nasal obstruction may be treated by surgical procedures, including septoplasty to straighten a deviated septum, and turbinate reduction to remove or reduce large turbinates and polyps. While these procedures may be performed independently as outpatient procedures, they are often used in combination with other procedures to treat sleep breathing disorders. Septoplasty is not a terrible procedure. Recovery is usually quick and less painful than most any procedure. However, to know if nasal surgery will improve sleep disorders (snoring and sleep apnea), find an excellent, highly trusted ENT to help you make a decision. It would be a good idea to follow behind the discussion with an ENT with a discussion with your sleep doctor. A second opinion from another excellent, highly trusted ENT would also be a good idea. How long can I expect to take to recover? How will I know if the surgery is a success? Will the doctor know if the surgery is a success immediately after the surgery based on his experience and the job he feels he did? What are the odds of me breathing well again and avoiding sinus infections in the future? Will the doctor be taking cartilege out of both sides or only one side of the nose? Will the doctor plan to use packing in the nose? If so, how am I to breathe since I have OSA? Will the doctor be placing splints in the nostrils after the surgery? If so, how long until they are removed? What pain medications will be used post-surgically? How many days should I anticipate being off work? Am I to bring my CPAP machine and mask to the hospital since I have to be admitted and spend the night? Will it be painful to wear the mask following surgery? To me, it seems like it would be very painful to blow the air onto the surgical site. What will the doctor do if surgery is not 100% successful? What if something bumps your nose during the recovery? After surgery, please try to have patience. Any healing process does involve time, and each time it varies based on how serious and lengthly your surgery was, how much they had to do to repair your nose (cartilage and the breaking of the nose as well as the estheics). Remember to follow the doctors's recovery plan, and be very careful and gentle with your nose. It will take up to one year for a full fledged recovery to occur, just be thankful that they fixed it, and now with some patience, you'll get there. If things get too painful, ask the doctor for some more painkillers, and most importantly, remember you have to nurture your nose and yourself. Daytime breathing is very much improved. Significant improvement with headaches (severe cases of deviated septum may cause headaches). Improvements in sleep quality and symptoms of daytime somnolence. Improves the treatment of sleep disordered breathing (obstructive sleep apnea) by decreasing the magnitude of the positive airway pressure necessary for an effective treatment. The lower the CPAP pressure, the better for you.